We offer to our clients a wide range of Derish that is a unique ecofriendly biotechnically derived herbal concentrate. It acts as a stress metabolite and has the ability to create defensive mechanism in plants, thus, having a role in plants resistqnce to pathogens and sucking insects on cotton , chillies, groundnut, vegetables and other crops. 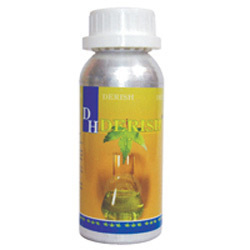 Furthermore, our range of derish is also known for reducing the feeding of larvae by including conversion in the gut and interferes in the metamorphosis of the insects at various stages. Moreover, it is also used to control the wide species of sucking pests. We are manufacturing and marketing biostimulants i. e. with brand name "Bioplus", "Bloomplus", "Bioplus Granules", "Biogrowth" used on all types of crops for better quality, yield, healthy crop. We are also marketing bio pesticides under brand name "Derish" for controlling thrips on all all types of crops.